Movie Ramble: Looks and Smiles. Made 18 months after Margaret Thatcher’s 1979 General Election victory, a turning point for all decent hard working people with the evaporation of common decency, replaced with a society that represents ‘greed’. Unemployment had risen to one and a half million but destined to rise further during Thatcher’s reign and inflation was almost 20%. 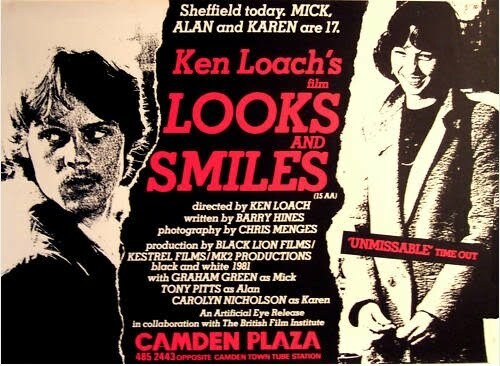 Looks and Smiles (1981) was set and shoot in Sheffield, a town in England that was once famous for its steel industry worldwide and based on a story by Barry Hines about a young courting couple that developed into a story of disaffected youth and the struggle for employment. 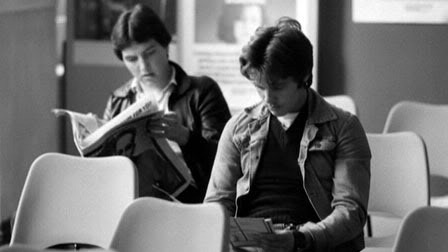 Mick Walsh is the central character and played by first time actor seventeen year old Graham Green, an apprentice mining fitter, who leaves school with qualifications but has no prospect of work, unlike his best friend Alan Wright, played by trainee truck mechanic Tony Pitts, who is old enough to join the army and be shipped of to Northern Island. The sixteen-year-old daughter of a Newcastle policeman Carolyn Nicholson who was studying for her A-levels at the time portrays Mick’s girlfriend shoe shop assistant Karen Lodge. Both Green and Nicholson never pursued an acting career but Tony Pitts went on to appear in the TV soap opera Emmerdale from 1983 until 1993. Ken Loach, who won the Young Cinema Award at the 1981 Cannes Film Festival, presents us with a film that to a great extent is as relevant today as it was in 1981. What we see is a young couple who probably will never have a settled life even if all their asking for is a job accompanied by a living wage and a home that’s warm and decent to bring up their bairns, is this really too much to ask? The film hopes to make us the viewer debate certain filmic statements: the army is the way out of unemployment, unemployed people can easily turn to crime, life for the unprivileged classes is a dead end street. It links these assertions with a bleak cityscape whose landscape includes industrialised wasteland and tower blocks. To this extent it’s an important film that should be watched in light of the fact that the Con-Lib coalition has not only declared war on the their normal targets, the poor and disabled, but also on the working class people in general. See also The Spirit of 45 (2012) for Ken’s update on the subject. The weekly visit to the Labour Exchange.